Millions of parents, teachers, & therapists have made little flip books of letters & sounds for their children, students, & patients – now you can SAVE TIME with this talking flipbook that is completely customizable to your needs! 3) Hear the sounds & words, or record yourself & play it back instantly! Includes over 2300 recordings of words in natural speech & 125 phonemes & clusters! Includes ALL vowels & consonants of Standard American English as well as over 250 sets of homophones! Sounds can appear in uppercase, lowercase, or IPA (international phonetic alphabet). See only real words, non-words, or both. Select any or all vowels (pure, diphthongs, or r-controlled) as well as initial & final phonemes & clusters. Flip between sounds or whole words. Kids will have fun learning on their own or working with an adult or therapist on specific speech, language, or reading goals as they flip through the words. Adults can use this app too for rehabilitation from apraxia, aphasia, or dysarthria, or for English-language learning & accent reduction. SLPs can generate a word list on demand, focusing on all words that begin or end with a given sound, or words that fit a particular phonological structure (e.g. alveolar-vowel-alveolar). 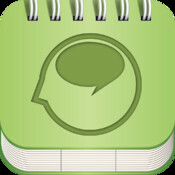 SLPs can use whichever therapy technique is indicated (cycles, minimal or maximal contrasts, metaphon, complexity, phonological awareness, traditional drill, etc) to treat speech sound disorders & use this app to generate the appropriate word lists! Words are paired with the sounds so learners can see the various spellings that go with each sound. Therapists are already seeing the results of children being in control of this app & improving each sound as they blend them together into well-articulated words! This app is deceptively simple – it can do so much once you learn to use the settings to achieve the word & sound activities you want. Additional instructions & videos on how to use the app for various purposes are available on our website.